I write in response to your speech at the launch of the New Zealand Initiative’s report “Un(ac)countable: Why millions on maths returned little” on 4 June 2015. With respect, the Crown’s recently released National Monitoring Study of Student Achievement has NOT shown that the system is failing a minority of students. To quote: “The curriculum expectation at Year 8 is that students will be working solidly at Level 4. About 41 percent of [approximately 2000] Year 8 students achieved at Level 4 or higher on the KAMSI assessment.” In actual fact, the system is failing the majority of primary school students in New Zealand, not a minority. 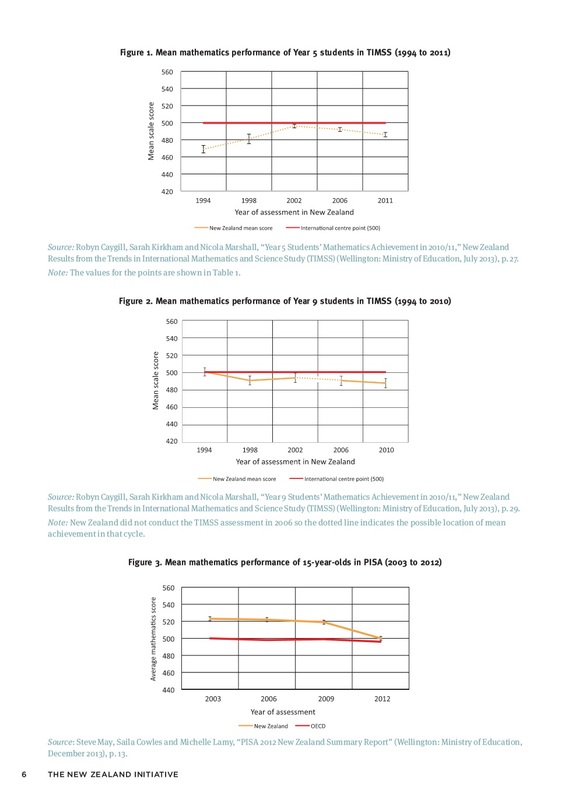 Looking at the graphs, we can see that Year 5 student performance in TIMSS has been on the decline since 2002, Year 9 student performance in TIMSS has also been on the decline since 2002, and PISA 2012 showed a sharp decline in the performance of 15-year-old students in mathematical literacy, in stark contrast to the OECD average. To say that New Zealand student performance in these international assessments has “declined slightly in recent years” is something of an understatement. Your commitment to raise the quality of maths teaching in New Zealand is welcome. However, the Un(ac)countable report shows that teacher quality is unlikely to have changed over the last 15 years, and the true reason for the decline in New Zealand student performance in mathematics is the loss of emphasis on the basics. Until the Ministry acknowledges the overwhelming evidence and addresses the deficiencies in curriculum content and delivery, throwing more money at professional development for teachers will, sadly, have little effect. That is why I have decided to share this letter, so that parents, teachers and principals can also examine the evidence and make appropriate choices for the children in front of them. By working together, I am confident that we will bring back column addition to New Zealand’s early primary maths curriculum. A report shows Kiwi kids are failing maths in higher numbers than ever before. Dr Audrey Tan says the $70M Numeracy Project was a failed experiment, and gives her recommendations on how to fix the current New Zealand primary school maths curriculum.